The Environmental Protection Authority (2002) in its Position Statement No 3 Terrestrial Biological Surveys as an Element of Biodiversity Protection and in its Guidance Statement No 56 Terrestrial Fauna Surveys for Environmental Impact Assessment in Western Australia (2004) and the EPA/DEC Technical Guide – Terrestrial Vertebrate Fauna Surveys for Environmental Impact (2010) require that fauna survey data are placed in a bioregional context. A quality Level 1 and 2 fauna assessment requires that all the available data in the vicinity of the project area in similar fauna habitat are considered in determining potential impacts on fauna and fauna assemblages in a proposed impact area. The Fauna Survey Database contains records collated from numerous terrestrial vertebrate fauna surveys in Western Australia. 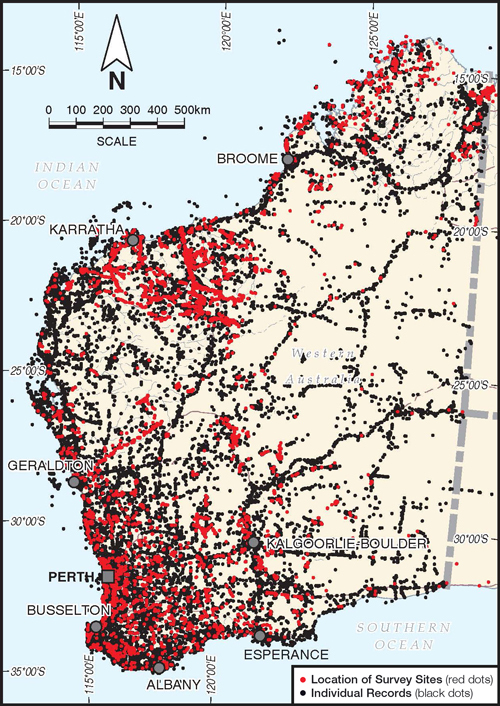 These data are invaluable in providing a regional context when assessing potential impacts be they for an Ecological Impact Assessment, a Native Vegetation Clearing Permit application or an EPBC referral. These data can also be used in due diligence reports to assess the potential for sites to contain conservation significant fauna or unique fauna assemblages. The database also provides a useful indication of the extent to which the terrestrial vertebrate fauna are known in the vicinity of a development proposal. The fauna survey database currently includes data for more than 8,800 separate surveys and for over 950,000 survey sites distributed across WA. This is the largest accessible fauna survey database available for Western Australia. Data mostly come from consultant reports and published research articles and reports. Inputting and updating data is an ongoing process. Terrestrial Ecosystems endeavours to ensure the database uses the current nomenclature.